A couple of weeks ago I was browsing an online forum and saw our good friend Troutrageous! posting a plan for a tenkara rod rack. 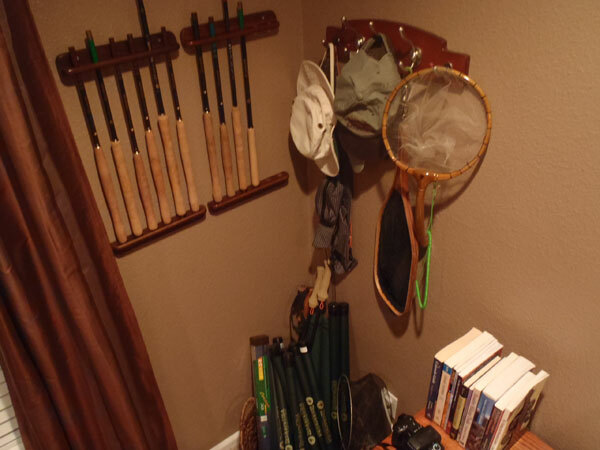 He is a passionate angler and wanted to proudly display his tenkara rods. Though I hardly ever post on forums, I knew a good solution to this one! Quite sometime ago I was trying to figure out a good method for selling our rods through fly shops. The solution to this problem alluded me for quite sometime since tenkara rods don’t display well next to western fly rods and their portability is a feature that I wanted to display that properly. While I worked on concepts for our Point-of-Sale display I would visit a lot of stores of different types to look for inspiration. In one of these outings, to a major sporting goods store, I noticed a pool cue rack in one of the aisles. The picture on the package automatically made me think of displaying tenkara rods in one, either for my own office or for the POS in our dealers. I bought one, brought it home, and in the same evening had another concept in mind. I got to work on that concept and never installed the pool cue rack. That original inspiration came in handy when I saw Mike’s (Troutrageous!) post online. I suggested he look into pool cue racks, and next thing I knew he had one neatly installed at home! He bought one for $9.46 and with that created a neat tenkara corner in his house. While we never quite expected so many of our customers to own multiple rods – though we should have known better – the tenkara rod rack concept has inspired a couple of other folks to do the same and create some very neat displays. Of course, maybe I should have just bought all the pool cue racks, renamed them tenkara rod racks and sold them along with the rods! Let us know when you do yours! By ericd June 26, 2011 – 8:37 pmFinding Trout Magazine in the mailbox with this story after just punhrasicg and fishing a Tenkara over the weekend was pretty cool. The first thing I have to say is that you must go out and hold one if it doesn’t sound like your thing. It feels perfect in your hand and once you tie on the line several places will come to your mind that you know it will be perfect for. I’m having a bit of trouble setting the hook, I bought a 13 5:5(slow action), and the takes are very light even when they don’t look it. Once you have a fish on though it’s very exciting and very simple and very addicting. My next few outings will definitely be those Tenkara waters. One thing I noticed, is that if you grab the line to release/loose the fly from a hang up and pull hard, the line will snap back at you and tangle and twist and frustrate you to untangle. I should have bought the video.Panfish are great for it too!